One of the bonuses of my new job is that I’m not only able to go along to many of the whisky tastings at the TWE shop in Vinopolis, but I’m half expected to so that we can write up the events on our blog. However, most of the time I’m backup writer and now that Toby from the shop has written up our most recent tasting I get to write about it over here. For this one it was especially fortunate that I managed to blag my way into one of the reserved seats as it was rather overwhelmingly oversubscribed. Luckily we predicted that and the right to buy a ticket was chosen at random from all the people who applied – over 300 for the initial 35 places. In the end we found a bigger room in the misleadingly cavernous expanse that is Vinopolis and managed to squeeze 50 people’s samples out of our tasting stock, and thus we had an Ardbeg tasting. The most popular drink that I’ve not delved into yet is most definitely brandy. Despite years of being dragged to wine tastings as a child, many of which ended with a tot of brandy, I have never really got round to tasting much since I’ve started to form opinions on drinks. My abiding memory is of not being able to bring the glass closer than a few inches from my nose as the strong smell formed an almost physical barrier for my arm, my brain stopping the pungent liquid from getting within a potentially damaging distance. I recently tried some Cardinal Mendoza and realised that I should probably give more brandy a go. 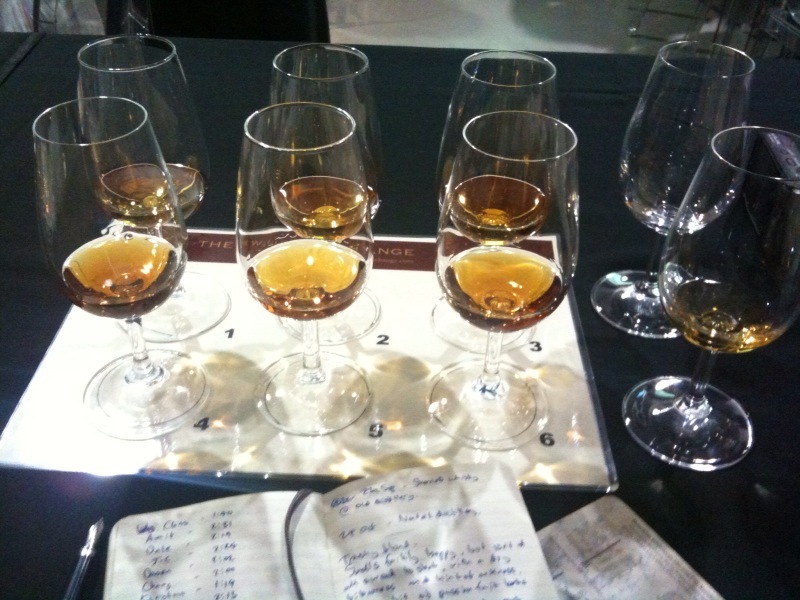 I, in my usual fashion, totally forgot about this until the details of the November tasting at The Whisky Exchange dropped into my mail box – a tasting of the Rémy Martin cognac range. A more expensive evening than usual, at £60, but with matched nibbly food and a promise of Something Special. The name of brandy is ancient, a derivation of one of the two names that are generally given to spirits, burned wine (brandwein, brandewijn), and producers use the other name, water of life (aqua vita, eau de vie, uisge beatha [whisky], etc) to describe unaged spirit. Brandy is, put simply, distilled wine. As distillation spread across the continent cunning tradesmen started transporting and selling it around the world – regular wine was quite bulky, but more concentrated brandewijn took up less space and could be watered down at the destination to provide a winey drink if required. This meant greater profits and as the trade grew brandy became the most popular spirit in the western world. It was slightly toppled by the phylloxera epidemic of the late 1800s, with whisky producers taking the opportunity to build their trade, but it is still one of the largest spirit categories in the world. There are two main named regions of brandy production in France – Armagnac, in the southwest near to the Pyrenees, and Cognac, based around the town of the same name about half way up the country in the west. Armagnac produces a lot of different brandies, with many small producers distilling and maturing their own spirits, but Cognac is known for its large producers, including Hennessy, Hine, Martell, Courvoisier and, naturally, Rémy Martin. There are still smaller producers around Cognac, but the business has developed over the years such that most distilled spirit is now sold to the big houses, who then age, blend and distribute the brandy. The six growing areas each have their own soil types, each producing different grapes of differing types and quality. The central areas, known as Grande and Petite Champagne, produce the best and most sought after grapes, wines and spirit, generally considered the most suitable for aging. They aren’t named for the Champagne wine region but instead take their name, as does Champagne, from the latin term campania, meaning field. The soil in the Cognac area is chalky and soaks up water like a sponge, locking it away during the wetter, cooler periods ready for when the vines need it during the hot summers. The grapes used are mainly Ugni Blanc, aka Trebbiano, the second most widely planted grape in the world. It doesn’t produce particularly interesting wines, with low alcohol and a high acidity, but makes a good starting point for brandy. In addition there is also Colombard and Folle Blanche (the old grape of Cognac and Armagnac, although it is not used much in modern times due to the fragility of the vines), although these make up about 5% of production with 95% being Ugni Blanc. 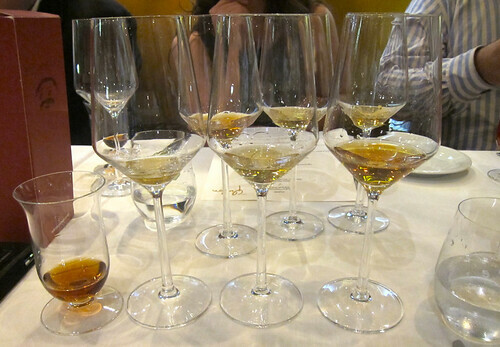 While the brandy houses do produce some of their own wine and distillate they buy most from individual producers, who do the growing, wine production and distilling. Brandy making isn’t an all-year-round process, and growers have to pick their grapes by September and distill their spirit by the 31st of March in the next year or it can’t be used to make Cognac. The brandy making process is as one would expect – pick grapes, press them, ferment the juice to make wine, distill the wine into a high alcohol ‘eau de vie’, age it in barrels. In Cognac the distillation generally has a couple of distinguishing features, at least for Rémy Martin. 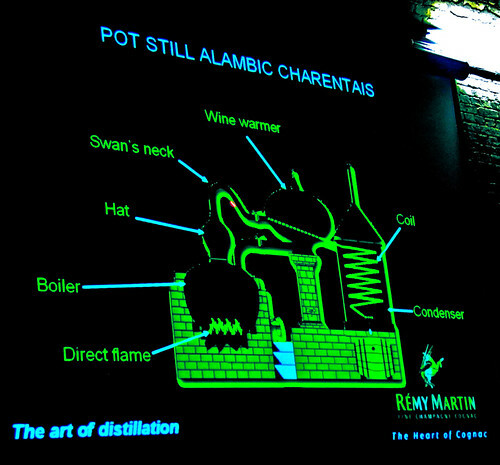 Firstly, they use pot stills, rather than the column stills of Armagnac, called an Alambic Charentais (Rémy Martin’s hold about 25 hectalitres). This is similar to the distillation process used for whisky, with an added chamber called the “Wine Warmer” which is used to hold the wine before it is put into the still and also has the pipe from the top of the still to the condenser passing through it, recycling some of the heat from the still to warm the wine. I found this rather pretty animation which explains what goes on. The first distillation, producing a liquid called the brouillis at about 25%, is then redistilled to produce eau de vie, at about 70%. This spirit is then put in barrels to mature. The second difference is that they distill the wine on the lees – the sediment of yeast and other bits that falls out of the wine as it rests is left in during distillation rather than being filtered out. This is done to give more flavour and a silkier mouthfeel to the spirit. Rémy Martin mature their brandy in overground warehouses to start with, moving them underground as they get older as well as moving the spirit to different casks, often older and larger than the new casks used for initial maturation. The evaporation from the barrels (the infamous angels’ share) runs to about 3% per year in Cognac, similar to that of Scotland, and a standard new barrel of 350 litres will be reduced to 100 litres of 40% liquid after about 50 years. The next step of brandy production is blending. As with most single malt whiskies, instead of bottling each barrel individually brandy is blended from a variety of casks to produce the consistent flavour profile for the specific brandy being produced. The classifications specify the minimum age of brandy used in a bottle but, again similarly to whisky, often older spirit is used to ensure that the flavour is correct. The blending is often done in large blending vats, some of which are very old indeed, with repairs being done constantly over hundreds of years. Caramel spirit is allowed, adding a depth of colour for consistency (whether that is actual consistency, or consistency with an ‘ideal’ darker colour that the producer wants to push on their customers as a sign of ‘quality’ or ‘age’ is a different matter) but it doesn’t look like Rémy Martin use it for at least their cognacs above VS classification. Rémy Martin has been around for quite a while, with the man the company is named for starting as a wine grower in 1724 and his descendants still running the business today. The distinctive centaur logo was introduced by 5th generation Paul-Émile Rémy Martin in 1870, also an era of expansion as they introduced their first premium product in 1874 – the Louis XIII. Claimed to be the world’s first ‘super premium’ spirit, it is still produced today and sells for a suitably ridiculous price. By the time the 7th generation rolled around further distinguishing from other spirits on the market was required and Andrew Renaud helped the introduction of the designation ‘Fine Champagne Cognac’ in 1977, used for Cognac containing only wines produced in the Grandes and Petites Champagne regions and applied to all of Rémy Martin’s regular output. The current president, Dominique Hériard Dubreuil, is the 9th generation of the family to run the company, with her father, André, being responsible across the world. While Rémy Martin produce some of their own eau de vie they are also the biggest buyer of Grande and Petite Champagne produce (buying in about 95% of their needs), setting up a growers alliance in the 1950s and paying a yearly fixed price with bonuses for spirit that is judged to be exceptional. Substandard spirit is rejected but doesn’t go to waste, being sold on to other companies with different standards or requirements to Rémy Martin. Our host for the tasting was Alex Quintin, UK brand ambassador for Rémy Martin, who had the designing of the Rémy Lounge at Vinopolis, the room we started the evening in, as one of his first tasks on taking over the role a few years back. My drinking companion Jason, of Whisky Squad organising fame, and I sat around in leather armchairs next to a replica blending vat, built insitu due to its size preventing it being brought in whole, awaiting the tasting with a brandy cocktail each. 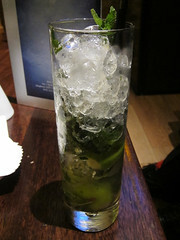 Jason had a French Mojito replacing the rum from a regular mojito with brandy, for a mix of brandy, mint, sugar syrup, lime and fizzy water. As with many rums in the regular mojito, the flavour of the spirit was overpowered by the other ingredients and it’d take a side by side tasting to pick this one out as different to the norm. 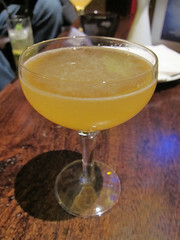 I went for a Sidecar, a much more traditional brandy cocktail originating sometime around the end of World War 1. It’s an equal mix of brandy, Cointreau and lime juice, stirred with ice and strained, and it worked quite well – citrusy and sweet with a hint of the caramel edge of the brandy peeking through. 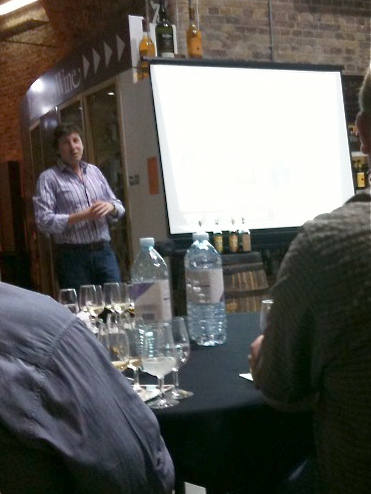 We then moved into the same room that I did the Old Pulteney tasting earlier this year to start the main event. 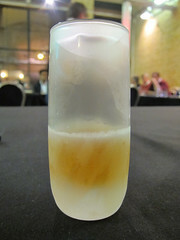 We started with a slightly different take on drinking brandy – Rémy Martin VSOP served at -18ºC. The small shooter that it came in was entirely frozen and it was served with a piece of salmon and cream cheese roulade. On the nose it had almost nothing, as one would expect for something served so cold, and to taste it didn’t have a whole lot more – a hint of fruit and warmth combined with a silky mouthfeel. The intention here wasn’t to give a lot of flavour, but to give the hit of cold and texture of the chilled brandy. It worked quite well with the salmon bite, cutting through the creaminess of the cheese and enhancing the smokiness of the salmon. 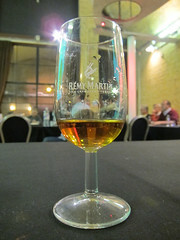 We moved quickly on to brandy number 2 – some more Rémy Martin VSOP, this time served at room temperature. It had a delicate nose, with vanilla, cinnamon, sultanas and peach. To taste it was rounded and fairly rich, although lacking a little in body, with spicy apples, more vanilla and a long sweet finish. This was served with some roquefort, which I donated to Jason due to being a cheese wuss. The VSOP is a blend of about 240 different cognacs ranging in age from 4 to 14 years, put together by the Rémy Martin cellarmaster Pierrette Trichet, the first woman to hold the position, and her team. It’s the most popular VSOP in the world, with over a third of all bottles sold in the classification being produced by Rémy Martin. As such its flavour profile didn’t surprise me – unsurprising, easy drinking and pleasant: the sort of thing that pretty much everyone will like. 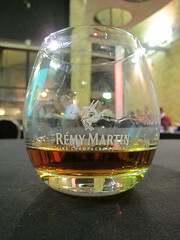 Third on the list was Rémy Martin Coeur de Cognac. A cognac that sits between the XO and VSOP classifications (and thus classified as a VSOP, I assume) which was first bottled in 2007, it aims at being more luxurious (luxury is a word used a lot around brandy) than the regular VSOP without losing the easy drinking appeal. This one was served in a slightly ballooned tumbler, great for general drinking but not quite so useful for nosing and tasting. The nose was spicy with a meaty richness. 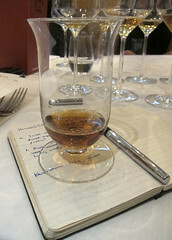 It was more savoury than the VSOP, with an underlying caramel brittle note. To taste it was very smooth, but there wasn’t much to it. Sweet fruit, a pinch of salt and pepper and a little bit of woody spice. Not particularly interesting, but very much a nice drink. Some ice was brought around and I dropped a cube in for a bit of experimentation. At first more sweetness and sour fruit came out as it watered down, but it didn’t take much dilution and quickly lost all of its fairly limited complexity. Worth a couple of drops of water if you don’t particularly rate it from the bottle, but not a lot more. The last in the regular range was brought out, filling our remaining glass – Rémy Martin XO Excellence. The oldest expression in the the normal range this is already at least 10 years old, with brandy up to about 37 years old also going into the mix of 350 cognacs about 85% of which came from Grande Champagne. It sat quite heavily in the glass, with slow moving ‘tears’ down the sides that Alex told us was in part due to the distillation on the lees, adding a thickness to compliment the richness of flavour. On the nose it was much more interesting than the first two, with sultanas, concentrated vanilla, almost ripe grape, sponge cake and a hint of PX. To taste it was rich and spicy, with cinnamon and cloves. It was also quite tannic with a cooling effect along the sides of the tongue, and a touch of menthol. The finish was long, rich and woody, lingering for a decent length of time. Much more my kettle of fish this, but not quite as tasty as the Coeur de Cognac, despite that brandy’s less interesting flavours. At this point we were out of glasses and having checked online the prices of the bottlings we’d tried I was starting to feel a little bit ripped off. However, we were asked to finish our drinks and follow Alex through to The Whisky Exchange’s shop, where we were confronted with a darkened room, red lit and with our final brandy centre stage – Rémy Martin Louis XIII. At about £1300 a bottle this is over half as expensive again as any booze I’ve drunk before and was the Something Special promised in the email. The brand has been around, as previously mentioned, since 1874, and is named for the king of France during the time written about in Dumas’s Three Musketeers. 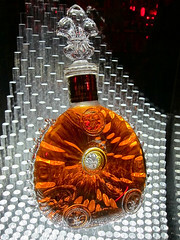 It is made entirely from grapes from Grandes Champagnes and is blended from about 1200 cognacs ranging from 40-100 years old. The final aging of the Cognac is done in giant 550l tiercon barrels originally used to transport brandy by ship in the 1800s. In the past it was sold by the barrel, but these days it comes in a hand-blown crystal decanter, with 24ct gold detail, made by Baccarat. We were served the brandy in heavy crystal wine glasses decorated with a fleur-de-lis, all adding to the theatre. On the nose it was very floral, with honey suckle, and sweet with delicately perfumed fruit – melon and peaches. There was also a hint of flowery honey and a marzipan nuttiness. To taste there was cinnamon, almonds and woody spice. My succinct note simply says “Like eating twigs and sweet flowers”. An impressive drink, but for me not £1300 of impressive. The Whisky Exchange’s (mostly) monthly program continues apace, this time bringing the manager of the Pulteney distillery, Malcolm Waring, down from far-off Wick to lead a tasting of the Old Pulteney range. 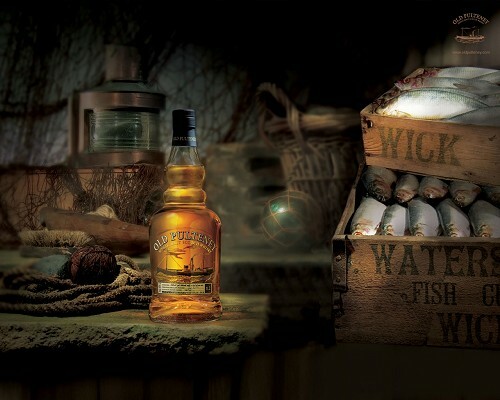 Old Pulteney is distilled in Wick on the coast in the far northeastern corner of Scotland, making it the most northerly distillery on the mainland – they’re 3° north of Moscow. The town of Wick has had a checkered history since the early 1800s, when Pulteneytown was founded on the other side of the River Wick. It grew as a major part of the North Sea herring fishing boom and the distillery, also named for Sir William Johnstone Pulteney who had commissioned the building of the town, was opened in 1826 by the James Henderson to serve the increasingly large population of seafaring folk who, in stereotypical fashion, liked their booze. Isolated from the rest of the mainland with few roads, the town became known for its lawlessness, with a potentially apocryphal 500 gallons of whisky being drunk per day by its inhabitants – with approximately 8000 fisherman in town (along with 81 bars, split 40 in Wick and 41 in Pulteneytown) that works out at about half a bottle per person per day. In 1922 the law stepped in and Wick (along with Pulteneytown) was made a dry town, with the distillery continuing production as the only scottish producer making whisky in a dry area. This restriction was lifted in 1947 and the distillery rumbled on quietly, changing hands several times, until 1997 when their first inhouse single malt bottling (as there had been a number of independent bottlings over the years from Gordon and Macphail and others) – their 12 year old single malt. The distillery is part of the Inver House group, who also own Balblair, Balmenach, Speyburn and Knockdhu (where anCnoc is produced), and also produces a liqueur in addition to single malts. Their style is quite simple – unpeated and using a mix of sherry and bourbon barrels, with no finishes. They are, as all the single malt distilleries are, quite finicky with their wood, going for air dried barrels as much as possible rather than faster produced kiln dried barrels – they generally get these from Jack Daniels and Makers Mark. They seem to prefer second fill casks, both bourbon and sherry (standardly oloroso), to mature their whisky with the less active wood working better with their spirit to produce the whiskies that they want. They do seem to use their barrels for quite a while, with rejuvenation (by planing down the insides of the staves before recharring them) after 2 or 3 fills to give at least another fill before the barrels need to be retired. Their brewing is quite interesting, using dried yeast instead of the usual wet yeast that most producers use. This is due to their relative isolation which restricts deliveries and makes getting fresh yeast in sufficient quantity very difficult. The dried yeast poses its own challenges as it needs careful temperature controlled rehydration to avoid killing it and it activates faster than live yeast on being added to the wort, starting the brewing process earlier than normal. Pulteney exploit this by using a medium length fermentation (52 hours) but produce a higher alchohol wash, coming in at about 9% rather than the usual 8ish. The peat-free nature of the current version of Old Pulteney is a more recent change in the distillery’s history. Until 1959 they had on-site maltings that used peat as fuel (sitting on the edge of the Flow Country they had a ready supply of it), but when that was closed they moved to unpeated malt, prepared offsite. They currently use optic and have since the late 90s, but due to varying yields (currently about 410l of spirit per tonne of barley, but in the past it has been as low as 405 and high as 420) are currently experimenting with different varieties. This is done more for yield than flavour, as the variation between different barlies isn’t particularly influential in the flavour of the spirit, but the amount of production is all important. The distillery was at one time part of a group including Ardbeg, so despite there being no peat in the spirit for years some Pulteney has a hint of it after being matured in second fill Ardbeg casks. Malcolm didn’t say much about those barrels, but I suspect that they may well be around somewhere as interesting single cask bottlings. Their two stills are quite squat, with a long neck on the spirit still and a lyne arm that comes off before the top on the wash still (as can be seen in the pictures on this account of a distillery visit), which all helps produce an oily heavily flavoured spirit. 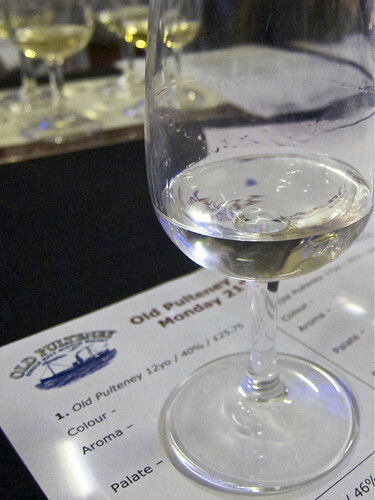 Malcolm had managed to bring along a small amount of the Old Pulteney new make spirit, which was handed around for everyone to nose and taste. It was thick and had a strong grainy smell which cut off abruptly, like with a high quality vodka. There were hints of oil, lemony floor cleaner, oranges and dry cardboard, as well as a whiff of rocket fuel – understandable as it was 67.9%. To taste it was surprisingly leathery, despite the lack of peat, the cardboardy nose taking on a darker turn, and also shot through with lemons. Water brought out some sweetness, especially as it developed in the glass, and tempered the lemon into a light citrus note that was dominated by the leatheriness. I’ve still not tried many new makes but this was yet again entirely different to the others I’ve tasted, with the lemon/leather combo both strange and surprisingly palatable for so strong a spirit. To start the tasting we were presented with the second whisky on our mat, with Malcolm preferring an order that worked better with the flavours rather than the regular youngest to oldest (plus special editions) order. #2 was the Old Pulteney 17 year old, an 80%/20% mix of bourbon/oloroso casks, bottled at a slightly strong 46%. On those nose it was oily with apricots, liquorice and a hint of sulphur. To taste it was woody, with sherbert lemons and apples. Water tamed the wood a bit, leaving a pleasant apple and lemon combo. We moved on to the Old Pulteney 21 year old, again a combination of sherry and bourbon casks (although using American oak sherry casks rather than European ones), and also bottled at 46%. This one had much more sherried sweetness on the nose with vanilla toffee, lemons and a hint of salt – almost like a lemony crunchy bar. To taste the wood dominated again to start, with lots of tannin and a heavy drying sensation down the sides of the tongue. Once you pushed through the wood there was butterscotch, apples and a hint of woody smoke (“Like toffee apples on the far side of a field to a bonfire on November 5th”, my increasingly flowery tasting notes suggested). Water turned wood into vanilla, upping the sweetness and bringing out more woody spice and sulphurous struck matches. There was a suggestion that the smoky notes were from the water, flowing through a culvert from nearby Loch Hempriggs (that you can follow to the distillery on Google Maps), but I’m still sceptical that the relatively minor flavour of the water survives not only mashing and fermentation but also the double distillation process. We then stepped back to #1 on the mat – the Old Pulteney 12 year old. This is the standard distillery bottling and is the only one of their whiskies to be chill filtered (none of them use colouring agents). This is a 100% bourbon matured whisky with about 80% first fill casks and 20% refill. On the nose it’s got brine, oil, some orchard fruit and wood, and a bit of almost ripe banana. To taste it’s sweet and buttery with more banana, some vanilla and a hint of saltiness at the back. With water there’s even more vanilla sweetness and the mouth feel becomes a bit creamy, all rounded out with a woody finish. This is the one that I’d tasted before and the reason why I came along to the tasting – I like briny whiskies and this is the one that introduced me to that flavour. Its appeal has diminished for me as my tastes have changed, but tasting it again for the first time in years I see why I remember it still. Next up was the oldest whisky that they standardly produce – the Old Pulteney 30 year old, bottled at 43% and matured in refill american oak hogsheads. On the nose it was nutty with mango and orange, very different from the younger whiskies. To taste it was oily with bananas, hazelnuts, dry oak, oranges (maybe some mushy red berries mixed with the oranges), vanilla and a lingering dry citrus finish – quite complex. Water brought out a wheaty, biscuity flavour (a bit like Nice biscuits if you scraped the sugar off the outside), Tropico (the tropical fruit squash that I used to drink on holidays to France when I was a kid – a scarily specific flavour), butterscotch, unsalted roasted peanuts and more vanilla, topped off with a tannic woody finish. I was rather impressed and this was easily my favourite dram of the night. Unfortunately, it also comes in a £245 a bottle, so I suspect it won’t be making its way into my whisky cupboard quite yet. The final two whiskies were a pair, unfortunately only available to travel retail (although The Whisky Exchange think they might have a few bottles appearing soon) – two 23 year olds. The first of the two was the Old Pulteney 23 year old Bourbon Casked, matured entirely in refill bourbon casks. On the nose it had bananas and butterscotch, and was quite light but with an underlying richness (which could well have just been my nose having been worn out by the 30 year old). To taste it had rich toffee, butter, sour wood and a tannic dry finish. It also had a hint of citrus and some oat cake – overall all a bit like slightly lemony shortbread. Water turned this into banana shortbread, knocking out the citrus, and softened the wood to creamy vanilla. It was similar to the 30 year old but for the more reasonable price of about £150. The second of the pair was the Old Pulteney 23 year old Sherry Casked, matured entirely in refill sherry casks, and filled and bottled at about the same time as the bourbon casked giving an opportunity to compare the wood influence. On the nose it had dark chocolate, nuts, raisins, stewed apple and oats. To taste it was thick, spicy and tannic with an oaty finish. 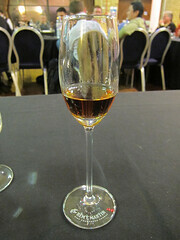 The sherry influence was clear with sweet dried fruit and plums sitting in the middle of the flavour. A touch of water mixed everything up to give garibaldi biscuits and a spicy wood finish. Very different to the bourbon cask, it reminded me of the Macallan 12, although with much more to it. Another month, another interesting tasting at The Whisky Exchange. The main difference this time is that I was actually able to attend rather than gallivanting around in places that weren’t the deepest depths of Vinopolis (which seems to get bigger every time I visit). This month it was the turn of Aberlour, with the tasting led by Phil Huckle, the Chivas brand ambassador who did the Chivas tasting I attended earlier this month. Aberlour is a Speyside whisky famed for its heavy use of sherry barrels, using them for complete maturation rather than just finishes. Unlike the way that Macallan traditionally operated they do also use bourbon barrels and their standard expressions are 50/50 mixes of bourbon and sherry cask matured whiskies, but there’s still a lot more sherry here than you will often see. The distillery was founded in 1879 by James Fleming, who became well known in Aberlour for his philanthropy, investing heavily in the local community and helping to build up the area. However, this fame was only after his death, as his involvement with his various was made under strict secrecy. The village of Aberlour seems to be more fully known as Charlestown of Aberlour, although the first bit seems to be generally missed out these days, and sits between Grantown and Elgin, in the heart of Speyside. The distillery is part of the Pernod-Ricard portfolio (hence Phil doing the tasting) and while not that well known in the UK is one of the top selling whiskies in the world, topping the charts in the biggest single malt market in the world – France. Next up we had the regular Aberlour 10yr, 50/50 sherry and bourbon casks, and a good way of seeing how the bourbon cask matured whisky affects the sherried whisky. On the nose it was sweeter than the last, with more light sugar, as well as the sherrylike dried fruit. It also had the distinctive bbq chicken smell that I mentioned before, nuts and a chunk of damp sherry barrel. To taste there was waxed wood obscuring some of the fruit and a soft spiciness. There was also a perfumed flavour not unlike Mr Sheen but, to quote Anna, in a good way. Water added creaminess and bitter oak while dropping a lot of the perfume and starting sweetness, but pushing some dried fruit to the finish. A rounded dram that definitely improves on the raw sherry cask by bringing in some of the lighter bourbon barrel influence. Next was the Aberlour 12yr, another 50/50 mix with a noticeably deeper bronzey gold hue. On the nose it was quite different to the earlier ones, with a savoury edge, sour cherries and an underlying meatiness. To taste it was quite creamy leading to sweet berries, spice and a woody finish. It also had a cooling menthol flavour that dried the edges of the tongue. Water made it chewier with more cream, vanilla, woody spice, dried fruit and a dry stony ‘granite’ flavour. Definitely developed from the 10yr, there’s quite a bit more complexity to this one and a drop of water really opens it up. We then moved on to what Phil predicted would be the star of the night, even if not his personal favourite – The A’bunadh. Meaning ‘origin’ in gaelic, it is a no age statement whisky (although generally made up of 8-15 year old whiskies with occasional younger additions) designed with the idea of recreating a victorian style – fully sherried due to the non-availability of bourbon casks in those times. It’s unchillfiltered and contains no caramel, the first of which, at least, is not true about the rest of the range, and is released in small batches, each numbered, which vary in flavour – we tried batch 30, the most recent one, which has just started hitting the shelves. On the nose there was the regular distinctive Aberlour-ness, although not quite so pronounced as usual, masked by sherried fruit, glace cherries and creamy creme brulee. In the mouth it was oily and exploded with nutmeg. Once you got over that (and there was a lot of nutmeg) there was honey and a long spicy finish, with more nutmeg. Water, and it can take a lot, calmed things down a bit, bringing out chocolate on the nose and a chocolate milkshake creaminess to the body. There was more fruit and spice as well as a tannic woody finish. In the middle it quite reminded me of lardy cake, which reminds me – I need to find a supplier of lardy cake… Phil was right – this was definitely the star of the show for me, especially as I can grab it at my local (posh) supermarket. Next was the Aberlour 16yr, continuing the standard range with a slightly darker colour and evolution of flavour. On the nose it had the normal bbq chicken woodiness but it was very light, with much more in the way of grapes, caraway, red fruit and a hint of butteriness – like something a lot closer to new make spirit than something that’s been in the barrel for a decade and a half. To taste it was very creamy, with sweet vanilla complimented by bitter wood, red grapes and mint, with a tannic finish. Water brought out vanilla to go with the cream, a lemony zing and cinnamon. Not what I expected at all, a much lighter flavoured and more zingy dram. The last on the mat was the Aberlour 18yr, a deep reddy gold dram that almost rivalled the darkness of the A’bunadh. On the nose it had fruit, heavy cream, prickly spice and the bbq chickeny wood that I now expected. To taste it was quite soft, with creamy wood and a dry toasted wood finish. The middle was filled with apples and pears with cinnamon, along with the toasted finish it was almost like drinking apple pie. Water knocked out the complexity very quickly, giving rise to icing sugar sweetness, vanilla wood and leaving a touch of apple. Phil’s favourite of the evening and well appreciated by many in the room, this was interesting but a bit light for my, by this time, rather deadened palate. Definitely one to try again. As a special treat Phil also managed to dig up a couple of more rare whiskies to round off the night, first of which was an Aberlour 23yr old single bourbon cask bottling, distilled in 1985 and one of the single casks that you can pick up at the distillery itself (although this one is probably now finished). On the nose this was light with apples, cream and freshly cut oak trees. To taste it was creamy with more apples, wood, vanilla and some hints of spice and nuts – like a very light fruit cake. Water seemed to intensify things, with it becoming apple pie and cream, with a cereal hint pointing to pastry. It was still very lightly flavoured and a hint of citrus helped it along to a woody finish. A beautiful light dram and one that you can imagine taming some of the sherry punch of the 10yr sherry cask and A’bunadh into something more approaching the regular house style. Last of the evening was a cask sample of 26 year old sherry cask, at cask strength. Being only a small sample there wasn’t quite enough to go round, leading to a quiz with correctly called out answers earning a generous dram. Fortunately my attendance and remembering things from the earlier Chivas Regal tasting helped out, with my correctly identified home city of the Chivas brothers grocery store (Aberdeen) winning me a slug of deep golden spirit. On the nose it was quite overpowering with toffee apples and sulphorous wood, and tasting it was an eye-watering experience with the alcoholic strength backed up with strong flavours of caramel, toast and wood. It was powerfully tannic, taking your breath away and leaving the tongue drying, but it also had quite a hollow taste, with almost everything happening on the front, back and edges of the tongue, with a gap in the center. Water, and as expected it could take a lot, calmed things down, bringing out leather, salt, caramel and softer tannins, with a hint of rubber running down the middle. An interesting whisky but one that shows more what using a sherry cask for too long can do rather than one that you’ll want to drink a lot of. An interesting tasting, despite my not being won over by the regular range. Finally having got a taste of the A’bunadh I can see why it was recommended as an alternative to the now increasingly scarce Yamazaki Sherry Cask that I served at my last whisky tasting – it has the rich sherried flavours, but also more wood than the Yamazaki, which becomes interesting when you add water. I also saw quite how far into the more overpowering ends of the flavour spectrum things can go, with the 26 year old cask sample being too much for even my sherry loving tastes, blasting through my fatigued palate and definitely ending my chances of tasting anything else – the comment I made about it on connosr was that it was like “being hit in the face with an oar after rowing over a lake of sherry”. 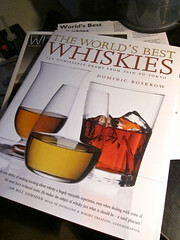 However, I suspect a bottle of the A’bunadh will be appearing on my shelf soon enough. Speyside single malt scotch whisky, 40%. Available in France. Speyside single malt scotch whisky, 40%. ~£20, available in Waitrose. Speyside single malt scotch whisky, 40%. Speyside sherry cask single malt whisky. No age statement (approx 8-15). 59.8%. ~£35, available from Waitrose. I don’t make many new year’s resolutions, but I decided this year that I needed to go to more booze tastings. After last week’s Talisker evening I managed to pick up a couple of tickets to The Whisky Exchange‘s first tasting of the year – a celebration of Glenmorangie, with Annabel Meikle, their inhouse sensory expert. It was held above TWE’s shop in Vinopolis and after a swiftie (of Schlenkerla Weizen) in The Rake I met up with Anna, whisky buddy extraordinaire, and repaired to the venue. We were confronted with 6 glasses laid out before us and before we dug into them a bottle of Glenmorangie new spirit was passed around – whisky that was too young to be called whisky yet. I’ve only tried new spirit once before, having grabbed a couple of miniatures of Kilchoman which had been in wood for a week, and this was notably different. I’ve described the Kilchoman as tasting like a cross between cattle feed and death, with a creamy silage taste and peaty kick – I rather like it, although not more than a tiny dribble at a time. The Glenmorangie barely resembled it – barely peated and never in wood, it had a clean crisp taste with a very light hint of peachy fruit. It tasted like a nice aquavit, drying and cooling on the tongue with a slightly malty aftertaste. Straight out of the freezer I suspect it would cause me great injury and from the large slugs that some of the other attendees were pouring the note I made of ‘MANY DEAD. SEND AMBULANCES’ was not that much of a jump in imagination. As the bottle circulated Annabel introduced us to the distillery, including the work to increase capacity that has gone on there since my visit in 2004, and moved us quickly to the first whisky of the night – the Glenmorangie 10yr old. This used to be one of my favourite whiskies in the days before I discovered a love of peat, but I’ve not tried it for a while. Annabel explained how the flavour has been changed over the last few years, gradually altering the proportions of whiskies from new and second fill barrels until they got to the second fill heavy mix they have today. On the nose it was quite dry and biscuity, with soft fruit and caramel. This continued in the mouth with some nuttiness appearing, leading to short finish. Water brought out wood on the nose and sweetened the flavour, adding more woody vanilla and, after some prompting from our host, some coconut. It was quite a pleasant whisky, with some of the thick sweetness that I like, although quite restrained. The second whisky was the Astar, the beginning of their range of more modern whiskies. Matured in designer casks, made from specially selected slow dried trees, after they’d been used to produce Jack Daniels (that last part, at least, a common theme in whisky making). I was quite interested to taste this one, as I’m quite sceptical when I hear of what seems to me to be too much attention to detail. It was similar on the nose to the 10yr old, but with less caramel, more wood and a peary fruitiness. It tasted interesting – a dose of caramel and hint of banana, cooling on the tongue and fading to a mild bitterness. Water opened up the nose, bringing out more soft fruit and adding a creamy richness to the flavour and mouth feel. It was quite a delicate whisky compared to what I expected and I wasn’t too shocked by its unstated age of 8-9 years – a nice whisky, but not one that I’ll be seeking out. Next up we had La Santa, the latest incarnation of the sherry finished Glenmorangie that I remember very much enjoying in the past – I think it may have been the first sherried whisky that I knowingly tried, and thus might be considered the beginning of my downfall. The original range of wood finishes was discontinued a few years back (I know of several people who are hoarding the last remnants of bottles of the port wood) and I’ve not had the chance to taste this new version as yet. This was a light gold whisky, richer in colour than the first two, and came from 10 years in regular oak and 2 finishing in oloroso casks. On the nose it was heavy and rich with caramel, although Anna reckoned it was crisp and green. It was quite sweet to taste with a hint of hazelnut and almonds, and a slightly creamy mouth feel leading to a fast fading flavour. With water the nose showed more fruit and a dash of vanilla essence and the taste became more citrusy with orange notes and a hint of tiger balm. The overall flavour for me though was hazelnut, which I didn’t particularly think went all that well with the other flavours. Annabel advised us to keep a little bit for later to compare against the more heavily sherried casks we were going to try, but I’d finished mine and didn’t feel much like revisiting it anyway. Whisky number 5 was a bit of a mystery – Annabel described it as a bit of a Marmite dram, with there being two camps – loved or hated. A non production cask, hidden at the back of the warehouse with (former chairman) David MacDonald’s name stencilled on it, it’s occasional sampled for tastings. It’s currently at 10 years in regular barrels followed by 10 years in sherry. Legally speaking the length of time that a whisky needs to remain in a wood to be said to be finished by it is unspecified (leading to my profit maximising idea of pouring unfinished whisky through sherry barrels to add a super quick finish), so this whisky can still be claimed to have a sherry finish, although it is very much towards the extreme end. Unreduced it smelled of creme caramel with spicy cherries and tasted surprisingly delicate with dark chocolate and a light fruitiness fading to a slightly bitter end. Watered the nose showed more saltiness and the taste opened up to give more soft fruits and a nice fruit cakiness. An impressive whisky and a nice surprise to be able to get to taste. The final dram of the night was one that some of the Whisky Exchange employees were glad to get a taste of – the £250 a bottle Quarter Century. A combination of whiskies from 25 years old and upwards, with a touch of oloroso finished spirit in there somewhere, it was a deep gold in colour and surprisingly light on the nose with hints of very dark chocolate and garibaldi biscuits. It tasted somewhat different with a muddled pile of flavours to start and a thick caramel sweetness leading to a strangely astringent aftertaste. With a touch of water the flavour widened, displaying hints of chocolate, berries, and a thick layer of slightly bitter sugar brittle. As refined in flavour as you would expect for the price, it’s not one for me to grab a bottle of but definitely one to sneak a dram of if you can. 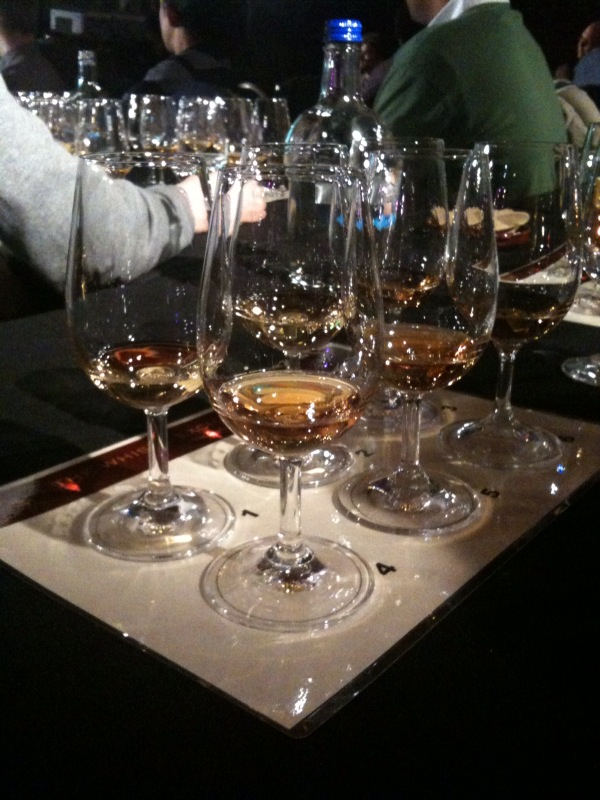 Overall it was an interesting evening which has definitely had the effect of bringing Glenmorangie back into my mind. Even if I didn’t really get on with their new range of finishes it has kicked me towards the Sonnalta and shown me that they do have a good selection out there, much more than they used to, and are always looking to expand what they’re doing. Partly an excuse to post a picture, shot in my ghetto studio mk2 with my new polarising filter, partly a real news story – it seems that there’s an Angostura bitters shortage on. 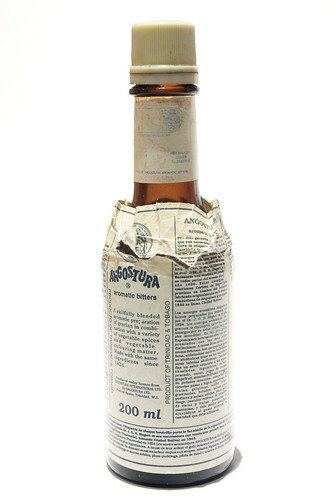 I’ve recently heard tales that the company that makes Angostura had gone out of business and as such there would be no more, however it seems that is not true. At least, that’s what the company are saying. According to The Guardian they had to shut down production for a spell due to issues with finances after the company changed hands. However, it seems that shipments have started up again and there may be Angostura appearing on these fair shores again soon. However, I was over at Vinopolis last night for a whisky tasting and ended up talking to one of the guys at The Whisky Exchange about bitters. He advised me against the Peychaud’s I’d picked up, as he reckoned it wouldn’t go well with the Rittenhouse 100 I’d grabbed at the same time (initially assuming I was going to make Sazeracs [which Peychaud’s is an ingredient of] and offering me a miniature of Absinthe to use as part of that recipe [experiments to follow when I do buy some absinthe], and then shocked that I might use it in whisky old fashioned. He let me buy some when I explained that I would probably use it in rum and brandy Old Fashioneds as well as just for general drink experimentation. I like the guys at The Whisky Exchange) and offered me Fee Brothers Old Fashioned as an alternative to Angostura, which he seemed to think were dead and gone. The Grauniad article is from last November and there is still a definite lack of Angostura on the shelves, so it may be more serious than was initially thought. The US is the main consumer (although at a measley 950k bottles you can see why most people have never bought more than one) and they seem to have supplies resuming, so hopefully the worst is over. The bottle above has been in my possession for the last 10 years, having been left in my first post-university flat by a house guest, and despite many years of drinking bitters laden cocktails I am still barely half way through it. Long may it continue. Update: While in Worcester this weekend for a birthday party I found a row of shiny new bottles of Angostura in Tesco. I’d like to think that this means that the shortage is now over rather than Tesco having a stash due to not selling much in Worcester. I still grabbed a bottle, just in case.